For restaurants, cafes, hotels and other similar professions, this promotional workwear can be a huge benefit. Particularly for companies working in the food industry, or for hotels, restaurants and beauty therapists, promotional aprons will be well suited. Monogrammed with your business logo or slogan, your waiting staff will look professional, whilst at the same time representing and spreading awareness of your brand. There is so much choice in this category, we stock full length aprons that loop around the neck, as well as shorter lengths that start from the hip and end at the knees. We also have styles that start at the hip and end near the ankle. All tie around the waist and several feature front pockets, perfect for storing notepads and pens which can be used to take food orders with. They are predominantly made from polyester and cotton blends, for ultra comfort in long periods of wear. Have a look through the allbranded web shop and order your promotional products today. Its important for any business to have a professional outward appearance, one of the ways this can easily be achieved is by dressing your staff in uniform. Aprons are widely used by those working in the beauty industry, particularly for people performing facials, manicures, and other such beauty treatments. Bartenders are also often seen in this type of workwear. For those in the hospitality industry, it is important to wear these garments in the kitchen to keep staff clean from all the food they are working with on a regular basis. For waiting staff, wearing workwear of high quality, printed with your business design, will make customers notice and think positively of your brand. It is the small details that add up to make a huge difference, and by having your employees dressed in smart, promotinal work wear , this detail is sure to be noticed by clients and business partners alike.In our web shop we also stock printed high visibility jackets made from durable polyester, for both adults and children. In addition to these reflective safety jackets, there are also high visibility backpack covers, which are useful for construction workers as well as late night cyclists. Promotional aprons do not just have to be used in a professional setting, they can also be used as thoughtful personalised gifts for work colleagues and business partners. Your clients can enjoy these promotional clothing items whilst cooking at home, and every time they go to make a meal they will be reminded of your brand and think of it fondly. These make brilliant advertising mediums at the start of summer, when people start to entertain friends and family outside with the BBQ. These would also make more unique and interesting promotional giveaways at exhibitions and events, anyone would be thankful to receive such a useful item. You can be sure that with daily use of these promotional aprons, your advertising message will be spread regularly. If you want to use these promotional tools to gather new clients, we recommend choosing the football themed set. These have a football pitch design printed on the front, and has pouches to store the all important grill utensils, this set comes with 5 football themed utensils including an oven glove and tongs. These can be used for grilling food on the BBQ, but can equally be used to protect clothes whilst doing the gardening. 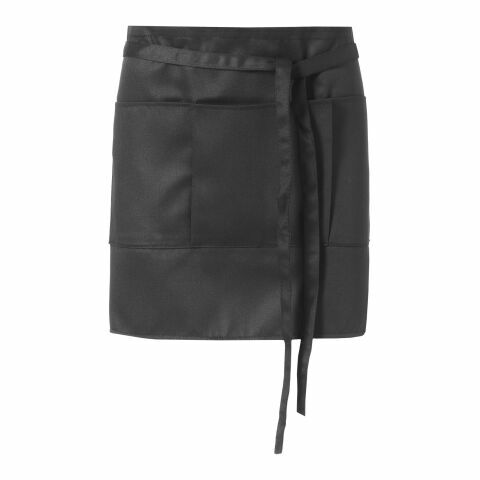 We have many short style aprons which would be ideal for bar staff as well as restaurants. The full length ones are used not just by those in hospitality, but by beauty therapists too. There are a range of fabrics such as cotton and polyester, with single front pockets, double, or none. We also have aprons specifically made for chefs, with contrast coloured buttons and piping to make it look like a shirt. There is so much choice in the promotional aprons category, have a look through our website and discover the right style for you. With allbranded, you have the choice to have these promotional aprons printed with your chosen business artwork. If you prefer, you can also have your design embroidered into the fabric, this will give a more premium look and will be particularly well suited for hotels, spas, and Michelin star restaurants. You can customise these as professional workwear, or as a barbecue and garden cover ups, printed with your corporate design. Weather you choose the professional kind with front pockets for your employees, or the novelty versions as thoughtful giveaways for your customers, there are endless opportunities to use promotional aprons. Your logo will be applied with through a high quality print screening process, or you have the choice to have it embroidered. The process is simple, if you have any questions however, please don’t hesitate to give our friendly team a call.